In his day job, Mike Bonney — a 1980 Bates graduate who chairs the college’s Board of Trustees — is chief executive officer of Cubist Pharmaceuticals Inc., one of the leading companies in its field. He’s also one of the six best corporate leaders in the country, in the view of MarketWatch, a leading financial news source published by Dow Jones & Co., which also publishes The Wall Street Journal. Michael Bonney ’80, chair of the college’s Board of Trustees, was recently named a top U.S. CEO by MarketWatch. On Jan. 17, MarketWatch announced the results of its 2011 CEO of the Year award, profiling not only winner Jeff Bezos, CEO of Amazon.com, but also the other five finalists: Bonney; Dell Inc. CEO Michael Dell; Whole Foods Market’s co-CEOs John Mackey and Walter Robb; and Electronic Arts’ CEO John Riccitiello. The MarketWatch articles do not delve into the undergraduate educations of the executives profiled, but Bonney is happy to say how his Bates education helped develop his talents and contributed to his success. “My experiences as a student at Bates really established my interest in learning as well as provided me the opportunity to expand my horizons beyond Maine,” Bonney says. 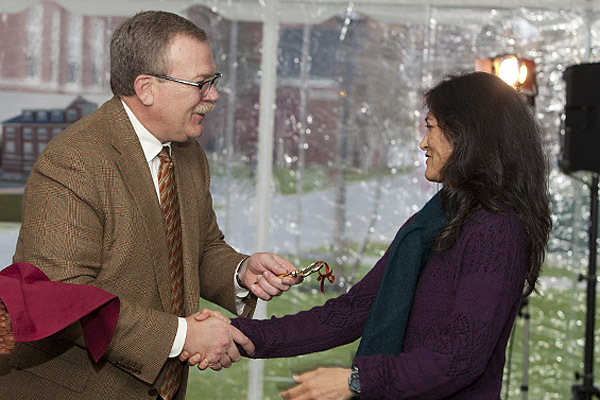 Mike Bonney ’80 presents a symbolic key to Roger Williams Hall to Spanish professor Claudia Aburto Guzmán during dedication festivities for Roger Williams and Hedge halls. Photograph by Rene Minnis. In a November 2011 interview with New England Cable News, Bonney explained how that interest in learning has influenced in his business career. “Early in my career I was offered what would have been considered to be nontraditional opportunities,” he said. “Many of my peers would have said, ‘I don’t want to do that,’ because those jobs took you out of the silo of a traditional path. I said, ‘This is an opportunity to learn something new, to have a new perspective on the business.’ That has allowed me to develop a greater breadth of understanding of how our business works, how we interact with regulators and with physicians and patients, which ultimately has been very helpful. Bonney has been a member of the Bates board since 2002 and was elected to chair the board in 2010. He and his family have many strong connections to Bates. His grandfather attended Bates and his father, sister, wife and oldest daughter are all Bates graduates. Another daughter is a member of the Class of 2012 and his son is a member of the Class of 2015. 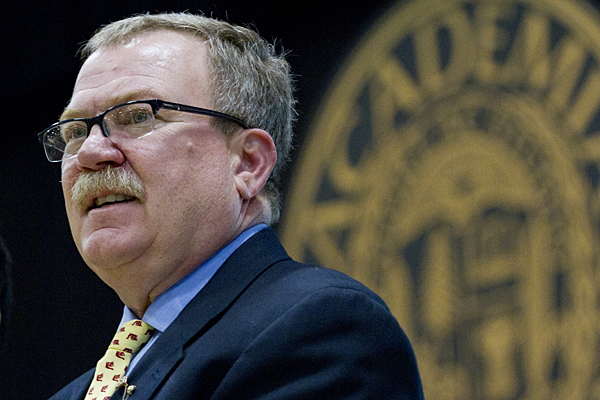 Both Bonney and his wife, Alison Grott Bonney ’80, have been very active in service to Bates. After graduating from Bates with a degree in economics, Bonney began his career with Maine-based Hannaford Brothers, working in the supermarket chain’s pharmacy operation. He later joined Zeneca Pharmaceuticals, holding positions of increasing responsibility in sales, marketing and strategic planning over the course of 11 years. In 1995 he joined Biogen Inc., ultimately serving as vice president for sales and marketing. He joined Cubist as president and chief operating officer, and has been president, chief executive officer and a member of the Board of Directors since 2003. In 2010, the Massachusetts Biotechnology Council recognized Bonney’s accomplishments in his professional field by presenting him its second annual Innovative Leadership Award, which honors an industry executive who represents a company with a strong presence in and commitment to growing in Massachusetts. Bonney is a director of the biopharmaceutical company NPS Pharmaceuticals Inc. and a member of the board of the Pharmaceutical Research and Manufacturers of America. He is a former board member of the Biotechnology Industry Organization.